This haunting film, based on the true story of Robert Elliott Burns, is an early thriller produced with the intention of exposing the harsh southern chain gang prisons of the early 20th century. Starring Paul Muni, already famous for his portrayal of Tony in Scarface: The Shame of the Nation released during the same year, the film was nominated for three Academy Awards. It tells the story of James Allen, an Army Sergeant in the First World War, who has returned home and is struggling to readjust to civilian life. His mother and minister brother have secured him his old job at the factory in New Jersey, however Allen’s true passion is for engineering. He says he longs to work with his hands in construction. He leaves his family and travels around the country from Boston to New Orleans looking for work. He begins to look like a vagrant as a he travels from city to city. Eventually, he meets a man (presumably in Georgia, though the film never explicitly identifies the state he is in) and the man offers to buy him a hamburger. However, upon arrival, the man forces Allen to rob the cash register at gun point until the police show up and Allen tries to flee but is caught. They kill the unknown man in a shootout. James Allen is then sent to work on a notorious chain gang, where black Americans are separated from white Americans, identifying the location as somewhere in the Southern United States. After weeks of harsh labor and brutal beatings, he witnesses a friend complete his sentence and leave the camp. Allen then devises a plan wherein one of the larger black prisoners helps him by bending the chains on his legs with his hammer while they are outside one day. He then goes to use the restroom in the bushes for two minutes and escapes. Allen is chased but not caught and he flees to Chicago where he assumes a new name, reversing his old name as Allen James, and he establishes a prominent reputation after years of hard work as an engineering laborer. His landlord falls in love with him and finds out about his secret. Although he does not love her, she blackmails him after discovering his troubled past and they get married. Years later, when Allen falls in love with someone new, she reports him to the authorities and they offer him a plea bargain if he willingly returns to do 90 days of work while they complete his paperwork in good faith. They promise to give him a comfortable desk job, but instead he is returned to an even more dangerous chain gang and they repeatedly refuse his plea bargain terms. Many in the state are furious at his publications attempting to incriminate the chain gangs during Allen’s time in Chicago. Irate, Allen and a friend, escape the chain gang again by stealing a truck. In the escape, his friend dies, but Allen is on the lam for than one year before he eventually appears one night before his lover. He only appears briefly to say goodbye as he must continually keep moving. When she asks how he will survive, Allen says he will steal as the film fades to black and ends. In truth, the film is an unforgettable masterpiece. Paul Muni gives a tremendous performance and the indictment of Georgia chain gangs is shocking. The film was banned in Georgia, followed by a lawsuit from the Georgia chain gang warden for libel, and upon its release when Georgia officials discovered the whereabouts of Robert Elliott Burns, he was arrested but the governor of New Jersey refused to extradite him. 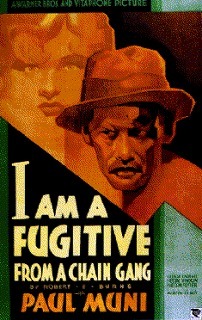 Burns was hired as a technical consultant on the film under an assumed name, as Robert M. Crane, and the film was heavily influenced by his autobiography entitled I Am A Fugitive From A Georgia Chain Gang! Sounds powerful indeed. I really enjoyed the review!